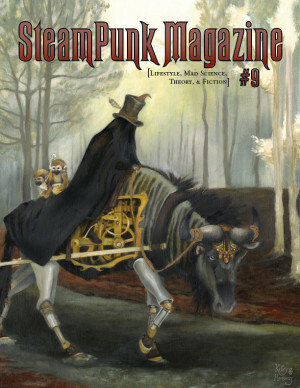 Steampunk Magazine » Artists Wanted! I meant to put this up AGES ago and didn’t get to it, so please pardon the delay and I hope this isn’t going up too late, but there’s a steampunk graphic novel looking for artists! It’s called AIR, and if you want to contribute you should probably apply quickly! If you’re less the artsy type and more the enjoying-comics type, Libby Bulloff tweeted about a steampunk-multicultural-feminist comic that is looking for support over at Kickstarter. It’s called Virtuoso, and it looks really cool, so I hope very much that it actually happens. This has been your webcomics-plug of the day. We shall return to your regularly scheduled blogging soon. Happy Fall Equinox! I’m not that wild about the project itself…but Kick Start is fantastic! What an excellent idea. It would be amazing to be part of the Steampunk Magazine’s graphic novel AIR. I will upload and post steampunk artwork as soon as possible. The graphic novel isn’t Steampunk Magazine’s at all – I was just passing the word along on behalf of the people running it, since I figured our readers would be interested. Sorry for the confusing! When I was young I had a dream. It was something about design and machines. I grew and when I was 25 I started a kompany for interieur-, metall- and technikal design. Have you heard that the US is going to have a Steampunk Convention in Arizona? It will be held at the Old Tucson Studios, which is famed for once being where several western TV shows and movies were filmed. It sounds like a perfect venue for a convention to me. Personally, I will be going, taking pictures, and would like to submit an article to the magazine all about the convention, if you are interested.